A cheap priced range ammunition for the expensive to shoot, 10mm cartridge. 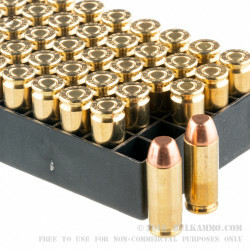 This ammunition is from the well-known, well-respected South Korean Poongsan Corporation, which has global military and law enforcement munitions contracts and who has been the purveyor of one of the best-known value priced lines of ammunition in the United States for several decades. 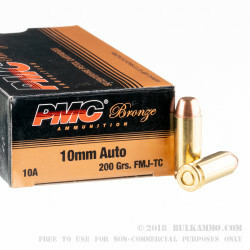 This is the Bronze line of the PMC brand and it offers a quality build, with a reloadable brass cartridge casing and a Boxer primer, at a price that is competitive with most local reloads. A range ammunition this is hard to beat - it is a consummate performer and the reliability is very good. The component mix and the overall build quality is well above average and that shows in the extreme consistency and reliability that PMC offers. This is a 200 grain load that offers hard hitting performance and can easily function in all the mainstream 10mm offerings and offers a pleasant load, with a slightly lighter powder charge (though the heavy bullet still has some substantial recoil). For a 10mm load, this offers a responsive ammunition, a simple build and a very good price point, meaning you get to add a little balance to your 10mm range options.